This is a poem about the loss of a pre-war order, itself already corrupt, iniquitous, tending towards destruction. However, interspersed with its final chaotic narrative of disorder, are a few untranslated lines of Sanskrit: ‘Datta. Dayadhvam. Damyata.’ Give. Sympathise. Control. This seminal poem of modern disorder ends with the affirmatory peace mantra of a Buddhist Upanishad: ‘Shanti.’ Peace. This is not meditation as a happiness-aid. ‘The Waste Land’ is a meditation upon ruin and destruction: its peace comes of contemplating, honestly and without egotism, the repercussions of disaster and loss. This is meditation as advocated by Marcus Aurelius: stoical and searing at the same time. Niamh O’Malley’s work is grounded in references to various forms of meditation. Like Eliot, O’Malley seems to meditate upon worlds that are disappearing or have disappeared. The realm of ‘The Waste Land’ is eminently public, of course, whereas that of O’Malley’s work is expressly much more private and personal. In both cases, however, Buddhist and monastic meditative practices enable portrayals distinguished by probing – even punishing – clarity. The subject, in the work included in her solo exhibition at the Douglas Hyde, seems to be the domestic world of her childhood. The show’s physical and conceptual centrepiece is a silent video work displayed on a mid-size flat-screen television, Nephin (all works 2014). Nephin is one of the highest mountains in Mayo, an 806 metre high peak that stands alone, disconnected from any nearby range. The mountain – its Irish name translating as ‘heaven’ – overshadowed O’Malley’s childhood home. In Nephin, over a twenty-nine-minute loop, we are brought on a circumnavigation of the mountain, filmed from a car window, in what feels very much like the re-enactment of a circular meditative rite. (The exhibition blurb confirms this, comparing Nephin to a traditional Buddhist pilgrimage around Mount Kailas in Tibet.) 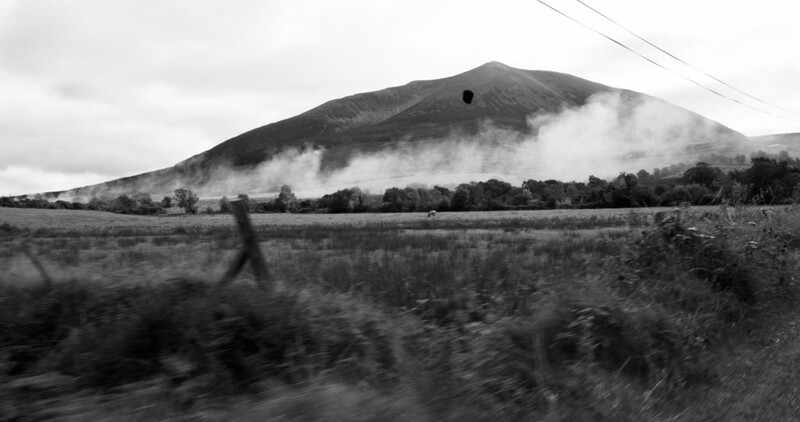 As the journey around Nephin proceeds, the terrain of an ordinary rural R-road unrolls: bungalows, ditches, telephone poles, farm buildings, fields, bush, and scrub, all of it watched over by a mountain that comes to seem, by virtue of its omnipresence, increasingly brooding, monumental – maybe even inescapable. It is also hypnotically watchable. Its small scale creates an intimacy with the viewer, for most of whom the passing scenery of ditches, brambles, farm buildings and machinery, scattered sheep and rocks on hillsides, will seem like recognisable rural trappings. But this sense of familiarity is short-lived. 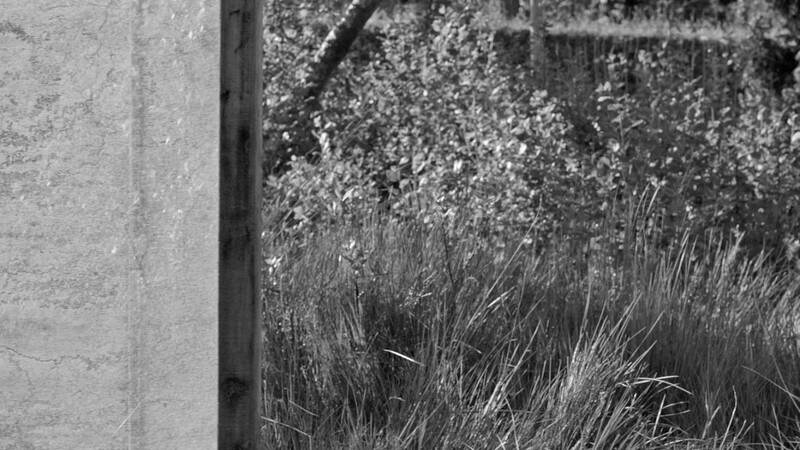 The black-and-white precision of the film work transforms the Mayo scenery, making it seem parched, harsh, utterly alien, utterly removed from traditional representations of the Irish landscape. There is a mercilessness to it that brings to mind the cinematography of the American landscape – the arid Texan desert, say, of the early scenes of Wim Wenders’s Paris, Texas. A black spot marks the upper left hand side of the screen: a blotch on the lens, obscuring the view. This blotch creates a blind spot in the work itself, suggesting the unknowability of the subject, the necessary artifice of its mediation. The monumentality of Nephin is rendered incomplete. A similar effect was obtained in O’Malley’s earlier work, Island, by the use of a screen that interrupted the video’s circular progression. In Nephin, this device becomes literalised. Unfortunately this actually detracts from its effect. On either side of the screen stand tall beech frames with panels of coloured glass, one ‘pale straw’, the other ‘rose’. 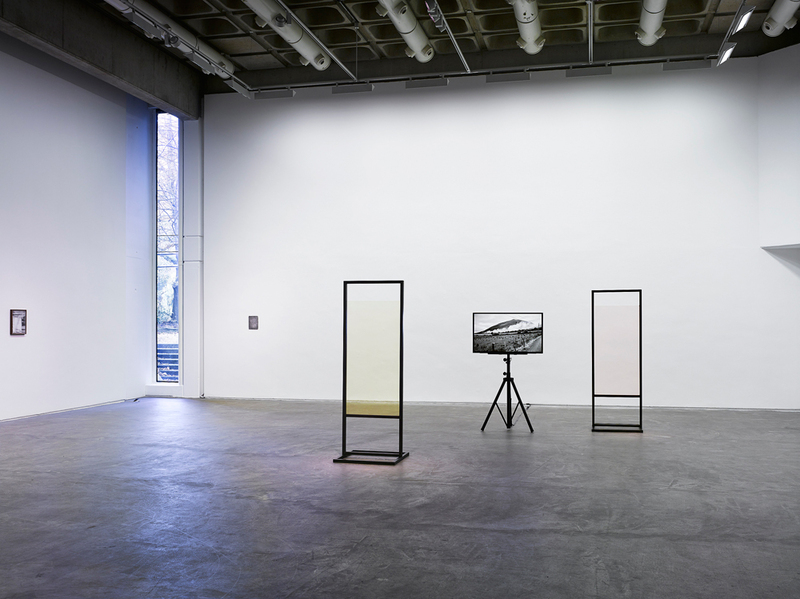 These are framing devices, offering the viewer alternative opaque frames through which to read – or mis-read – the moving image. But they are also imbued with potent material resonances in their own right. I remember just such coloured glass in the panels over the hall doors in my grandparent’s house in Tipperary. These are the recognisable colours of a species of domestic interior design, prevalent in the bungalow boom of the 1970s and 80s, much of which has since been renovated out of existence. And it is not just the colours. The materials across the exhibition – stained beech, walnut, amber, foiled and opaque glass – seem to suggest those of an Irish country bungalow up to about the 1990s. One small enigmatic work, Composition, calls to mind Lyubov Popova’s famous ‘architectonic’ compositions of almost a century ago: a dull grey square, fixed without a frame to the gallery wall, is intersected by a vertical sliver of stained beech, the very colour and texture of a ruler you might find in a rural two-teacher national school. The result is an impressively taut exercise in abstract geometry. Glass appears in almost every work in the gallery. Double glass, floor consists of two large partial panes of glass, uneven at the edges, layered one on top of the other on the gallery floor. Foiled glass, floor is a small mosaic of decorative glass, bent out of shape and gapped, lying crumpled over a solid beech rest. These are works that ask questions about mediation and transparency, about ways of seeing, and mis-seeing. But they also seem to recreate a remembered domestic world in all its specificity, its materials of choice, its decorative flourishes, that O’Malley brings out with painstaking, almost devotional care. This care for the past imbues the exhibition with a pervasive sense of fragility, at odds with the monumentality of Nephin at its centre. These two seemingly contradictory impulses converge to powerful effect in O’Malley’s work, which comes to seem like a ruthlessly clear-eyed contemplation of a vanished domestic world, one which feels in some ways suffocating, but is also a site of nostalgia. As such, the work manages to be both nostalgic and brutal. The material is spare, rendered with a critical sense of the distortions of perception and time, and, beyond that, a broader philosophical sense of circularity that verges on the nihilistic. This metaphysical focus imbues the exhibition with a monumentality that manages not only to meet, but to overpower, the brutalist monumentality of the Douglas Hyde. The other video work in the exhibition, Glasshouse, conveys most powerfully this complex of effects. A single video work (again a twenty-nine-minute loop) is displayed on two screens side by side. The camera pans slowly around the inside of a glasshouse. But the two screens are out of sync. The camera pan on the left will halt, the right continue, then vice versa. The connection between the two, which seems fluid at first, is broken up almost musically. Like the black spot obscuring Nephin, this device highlights the artifice of the arrangement, but here its effect is much more compelling. The result feels almost like a sad, slow waltz. The glass of the glasshouse is broken in places, obscured with dirt in others. Beyond it a once-cultivated garden has gone to seed. Brambles grow everywhere. A few wilting sunflowers protrude. In light of the work surrounding it, this feels like another ambivalent tribute, a meditation upon a now-derelict rural home, a place of opacity and privacy and distortion, portrayed starkly and with unforgiving precision. Nathan O’Donnell is a writer based in Dublin. T. S. Eliot, The Waste Land and Other Poems (London: Faber, 1972), 39.